1. What is Pantri Pobl? 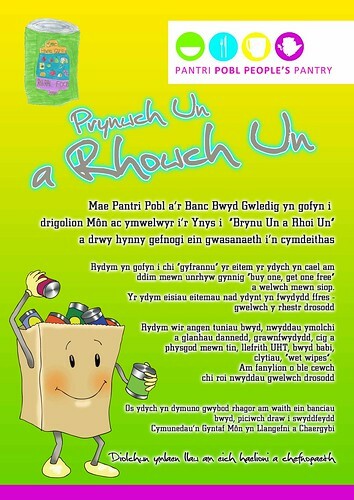 In 2011, Ynys Mon Citizens Advice Bureau (C.A.B.) staff identified a troubling increase in the number of families struggling to make ends meet. Working families whose wages are not stretching as far as they should, have had to ask neighbours for hand-outs and some have resorted to theft in order to feed themselves and their children. A Pantri Pobl/People's Pantry has been set up to address this problem of Food Poverty. 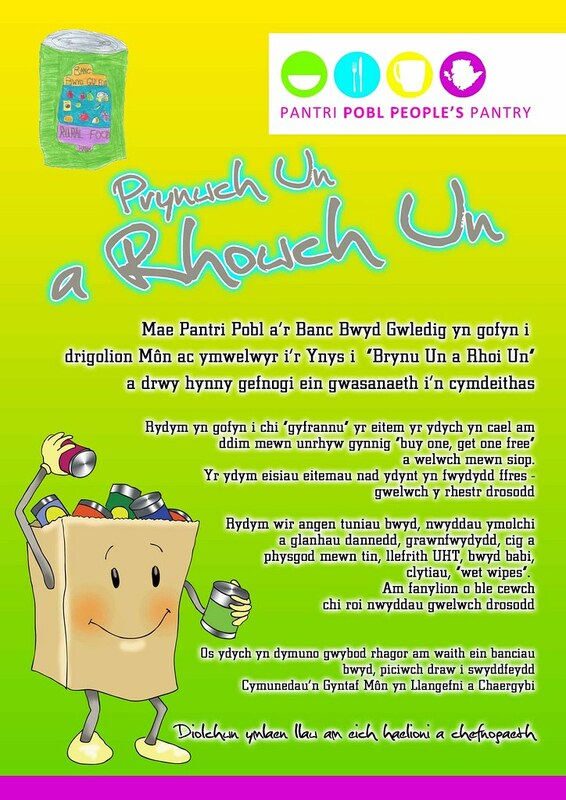 Plas Cybi Partnership has joined with the Citizens Advice Bureau, Tudur Communities First Partnership in Llangefni and Barnardos to put together food parcels and to distribute them to those most in need. 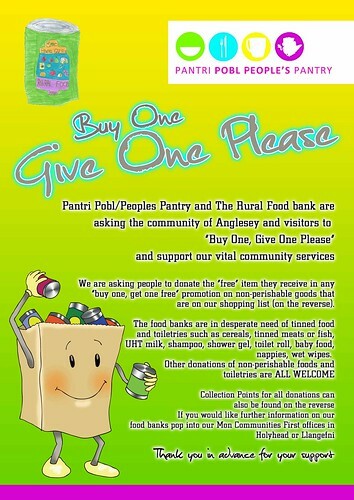 Pantri Pobl are asking the community of Anglesey and visitors to "Buy One, Give One Please" and support our vital community service. 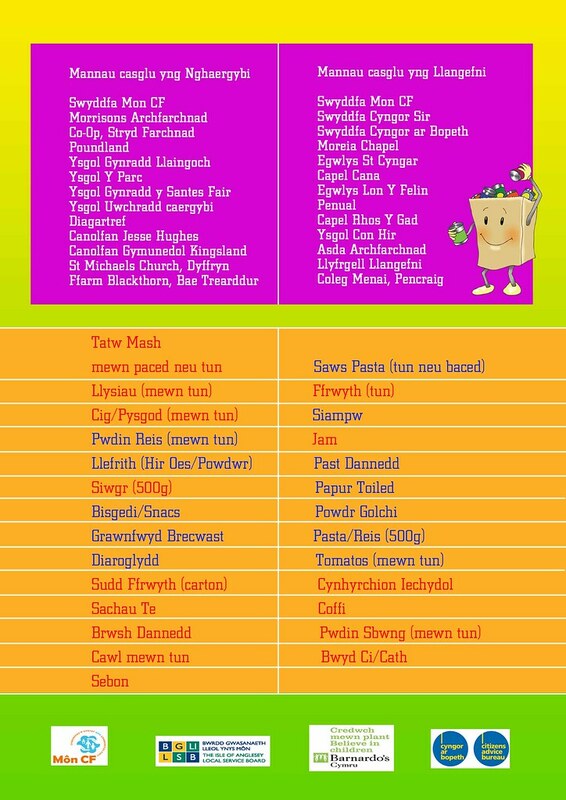 We are asking people to donate the free item they receive in any "buy one, get one free" promotion on non-perishable goods that are on our shopping list. 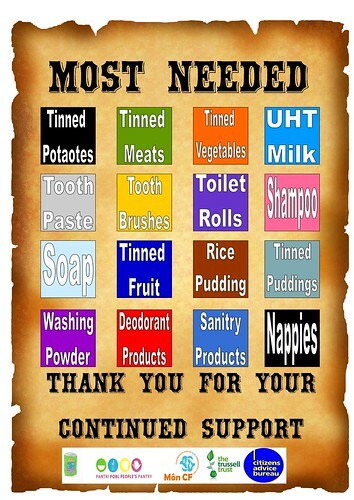 Would you like to help those in need on Anglesey? 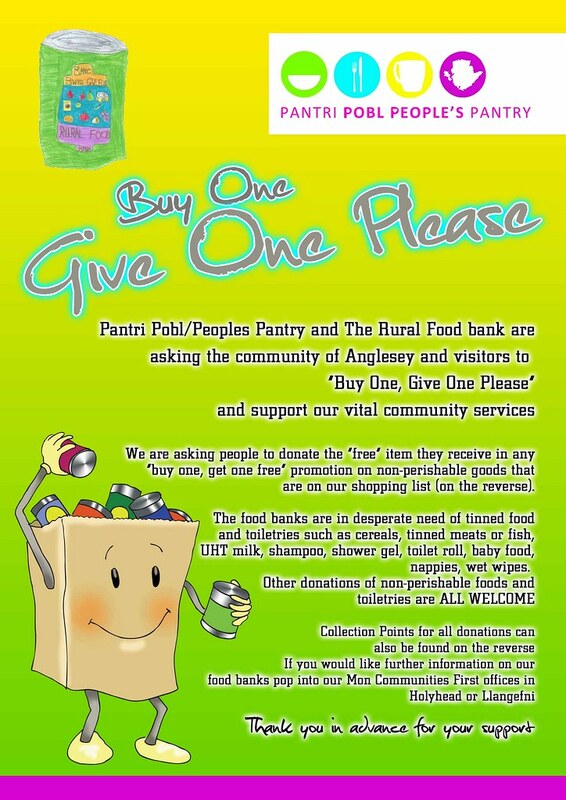 As a response to the rising numbers of Food Banks within Anglesey (Pantri Pobl, Anglesey Trussell Trust (based in Holyhead and Beaumaris), The Rural Food Bank and Pantri No.6 (Amlwch) agreed that there need to be coordination and coherence to ensure the best service was provided to the most people in need as possible. A meeting was convened and it was agreed to form the Ynys Mon Food Banks Partnership. It was also agreed that Pantri Pobl would act as lead partner. The Partnership successfully developed an infrastructure behind the food banks and to ensure that every effort was made to realise quantities of produce from food producers and retailers and that this would be distributed fairly, effectively and efficiently. It is also working on how to develop a joined -referral system, good practice procedures for sign-posting, marketing to help with fund raising for produce and also a clothing bank. 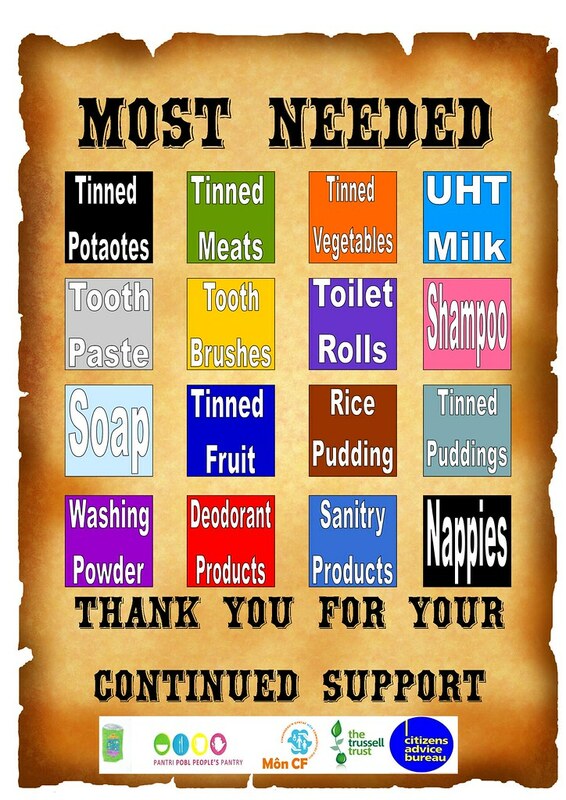 As well as providing emergency food, all partners are committed to promoting employment, signposting to money advice, debt management and household budgeting services, and other sources of support to develop resilience and help people to move on and out of poverty, in particular their dependence on food banks. The main aim of the Partnership is not to create dependency on food banks, but to move people – where appropriate – into employment with the help of a range of supporting services. A second aim is to work with food suppliers and retailers to reduce the amount going to landfill (reduction in carbon emissions) and to redistribute to those in most need.